Boxes of chicken legs and thighs are such a great thing to pick up and have in the freezer as back up. They tend to be so versatile in how they can be cooked, what sauce can go with them and what you put with them and they are generally on the cheap side for the amount of meat you actually get. I decided to give something a little different a try recently, that mentioned in the title, an orange and tomato sauce with the chicken and sesame chips. If you are interested in the method then just keep on reading! My thoughts on the dish will come after the recipe, to save those that just want to get on with cooking from having to scroll through a load of jibber jabber though there are tips on things I would change in that section so if you read on it will only improve your attempts at the dish. 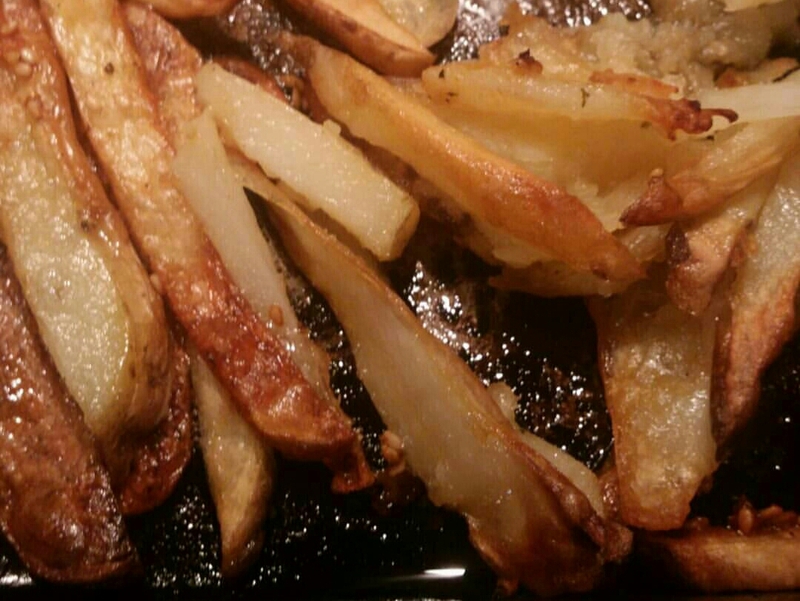 I shared the process of cooking the dish on my instagram stories at the time and had a few messages saying this looked like a tasty dish and an unusual approach to doing the chips. 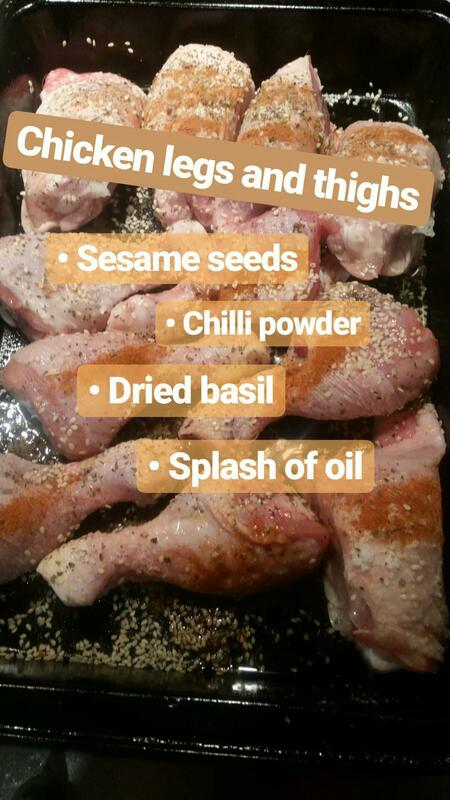 Mix your chicken legs and thighs with sesame oil, some chilli powder (depending on strength of powder and heat preferences), dried basil, a healthy handful of sesame seeds and a splash of oil. Place in a metal tray and then into a pre-heated (at 200°c fan) oven. Boil your finely cut potatoes whilst step one is underway and then drain them as well as possible. They do not need to be soft all the way through at this stage just part cooked. Finely chop some onion, garlic and mushroom and add to the ceramic dish that is currently in the oven. Place into the oven to start cooking a little. Once the chicken has been in the over for about 20 minutes remove both the trays from the oven. Use some tongs to move the chicken from the metal tray to resting on the bed of onions etc. Place the ready to go chips into the metal tray with the chicken juices, oil, sesame seeds etc. Put both trays into the oven for another 30 minutes. I would suggest putting the chips on the higher shelf of the two to get a better crisp but this can of course depend on how effective your oven is. At this stage take the chicken out and check it is cooked properly, giving it a little move around to ensure nothing is stuck to the dish. Give the chips a shake around as well and move these to the lower shelf in the oven. 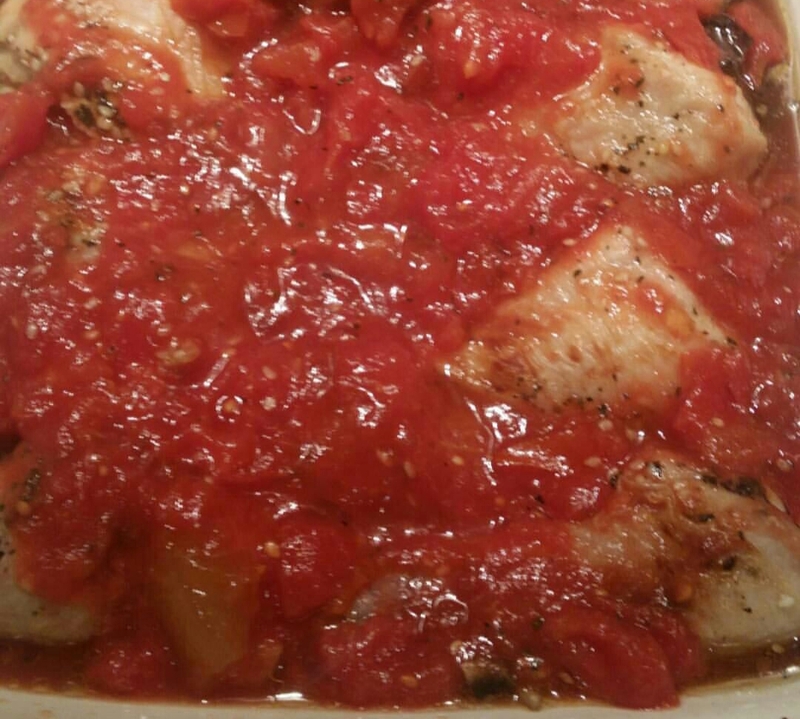 Put a tin of chopped tomatoes and two to three tablespoons of finely grated orange marmalade mixed in with the chicken. At this stage you can give everything a good mix around to incorporate the onions etc into the sauce. Add a little seasoning and pop this into the oven for a final ten minutes. Prepare and cook your vegetables. I like my broccoli to still have a healthy crunch to it so usually pop it into a pan of cold water and only have it boiling for a couple of minutes before serving (the broccoli obviously cooks a little whilst it is attempting to start boiling). Serve up! The chips should at this point but crispy on the outside but soft and fluffy on the inside whilst having a little crunch from the sesame seeds coated on the outside. The amount that I cooked, using a whole box of chicken legs and thighs comfortably did enough for four people meaning we had tasty leftovers and seconds to enjoy, but this is easy enough to alter the quantity of each item for depending on your serving needs. Overall, I found this to be a tasty enough meal. The chicken was cooked well, it was moist on the inside but had a crispy skin on the outside, but the initial flavours of the chicken were perhaps a little lost on the sauce. On reflection this sauce probably needs making and reducing on the hob a little before being added to the chicken or it needs to be added earlier so it can merge together a little more. The sauce could have done with an additional vegetable or two, perhaps carrot, to give it a little bit more crunch and texture during the eating process. The chips were great. I only added a small handful of sesame seeds when I did it, which is why I suggest a large healthy handful in the method, as there was not enough of them to be on each chip and to provide a real consistent crunch to each one. 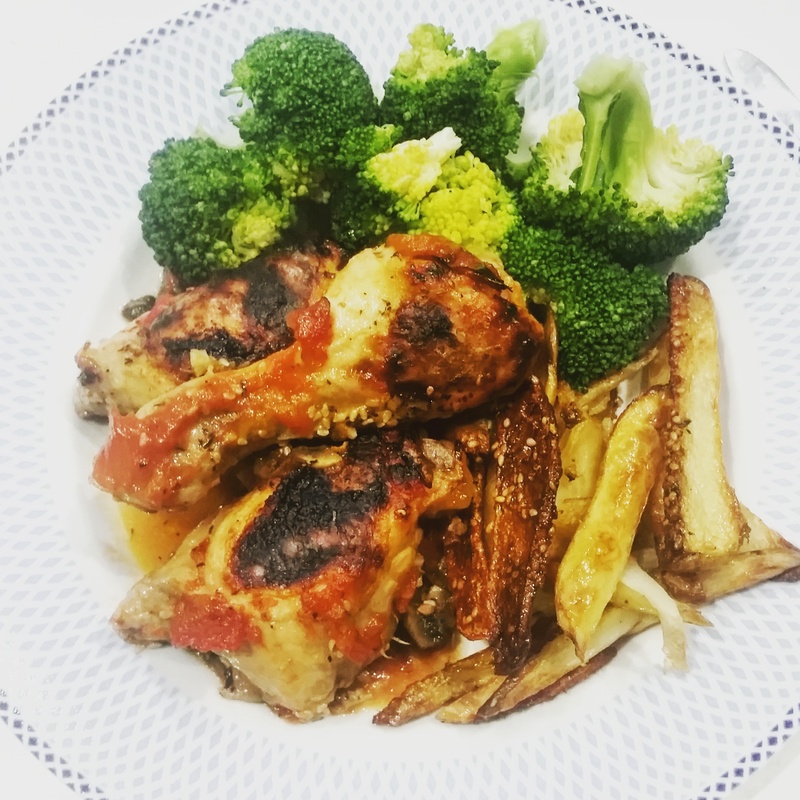 The sesame seeds really helped to add an additional flavour to the chips, a nutty element, that really complimented the chicken but more so the broccoli to help unite the whole dish on the plate. 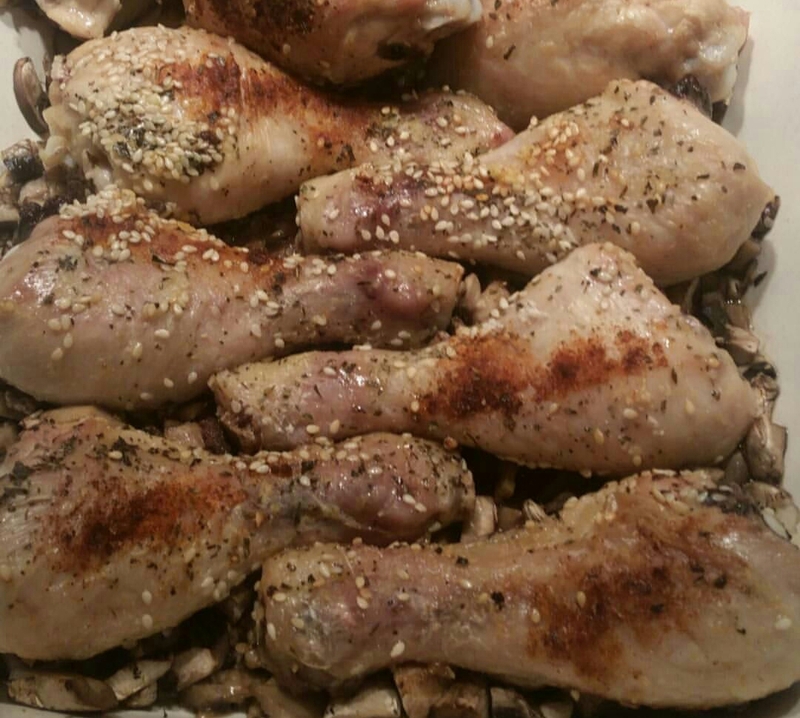 I would love to hear your favourite way to cook a pack of chicken legs and thighs in the comments below or over on my twitter or instagram. This entry was posted in Food and Drink, Recipes and tagged cheap recipe, chicken, chips, Cook, cooking, eat, eating, food, food blog, food blogger, food bloggers, fries, healthy food, home, home cook, home cooking, lblog, lblogger, lbloggers, leftovers, life, Lifestyle, lifestyle blog, lifestyle blogger, lifestyle bloggers, meat, method, orange chicken, quick cooking, quick dish, Recipe, recipe blog, simple food. comfort food, tasty, tomatoes, vegetables, yummy. Bookmark the permalink.